I’ve been wanting to expand my retro wardrobe for a little while, and what better time than my Birthday?! I have recently purchased these items, (or received them for my birthday) and wanted to try and style them as, because of my uniform at work mainly, I know it will be a while until I can wear them out! So first of all, I tried on this outfit, which instantly made me feel like I was on the set of ‘Grease’! I received this red satin-like skirt from a mystery pack from Little Booteek – they give you different prices and what you get is a surprise! I love this idea as I was indecisive as to what to buy! I purchased the £10 mystery pack – the skirt would have cost £30! It was a little creased from being in my wardrobe and from the material, but a bit of steaming and wearing would certainly help. I styled this with a Lindy Bop petticoat which filled it out nicely and my Pin Up Couture heels. I also wore my new top which was a birthday present from my fiancé Ross (he did well!). This blouse is from Dancing Days by Banned, which is quickly becoming one of my favourite brands. The collar also features as a scarf, so almost like a pussybow blouse with a firm collar. It is very interesting! The polkadots are velvet which I love – I’m not a big fan of polkadots but these are an exception! My new favourite item to wear, especially this time of year, are swing trousers! I already own one burgundy pair, but these were a different style and colour! 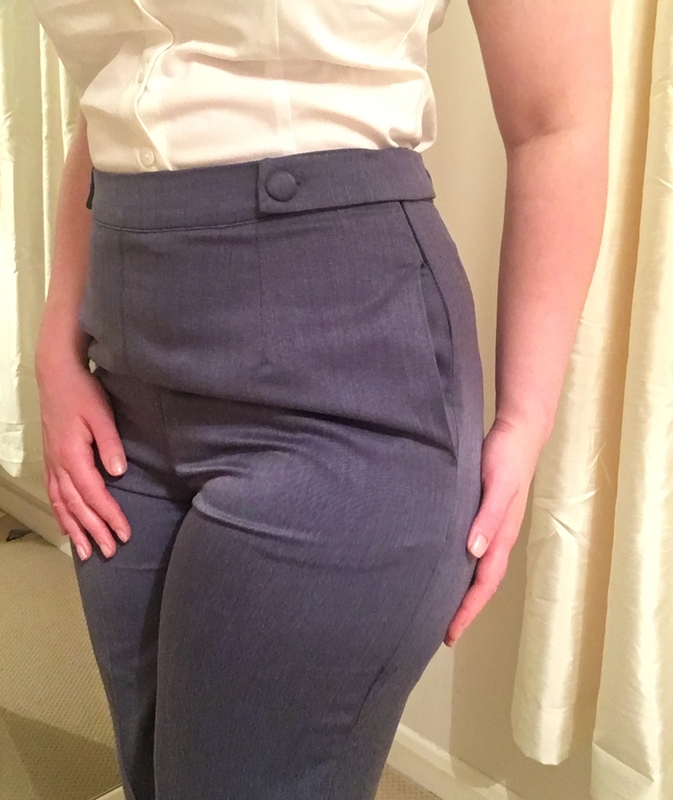 I find swing trousers an effortless way to wear a vintage look, and they are so comfy! These again are from Dancing Days by Banned and I love the button features on the hips! These particular trousers seem a little more slimline on me, which I quite like, as well as a good pleat down the middle. Because they are longer in the leg, they work well with heels! I wore this with my Collectif lace blouse. I often think I would like to work in an office, just to wear outfits like this! This is a recent purchase from eBay – I highly recommend looking for items here as you are likely to find a bargain – this is where I find a lot of my vintage style things! 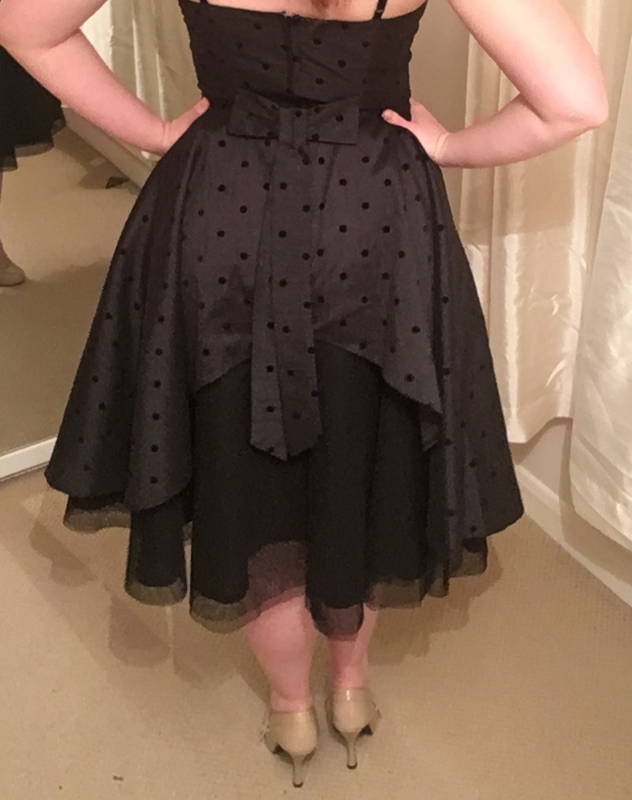 I’ve had my eye on this dress for a while now; it is from my favourite, most worn brand Collectif. I love this casual style dress as I don’t often have the opportunity to ‘dress up’, this gives me an easy daytime vintage style. 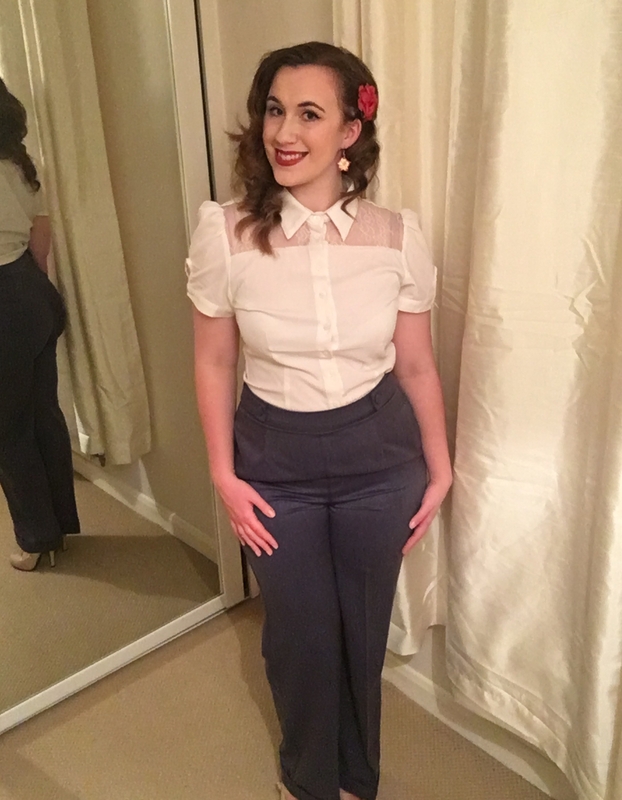 I wore this outfit to The Affordable Vintage Fair and felt amazing! It has a full circle skirt and I love the belt that comes with it, it really cinches in my waist! Also featured in this picture is my trusty Collectif handbag – also bought for me by Ross, but a few years ago! It certainly finishes an outfit well and goes with everything! Finally, I have this dress from Hell Bunny, which I purchased in the sale at my local retro shop, Pocket Watch and Petticoats. I bought it with the thought of perhaps wearing it to my works Christmas Party! I tried it on in the shop and was surprised to find the detailing in the back! I thought it was so interesting and different! 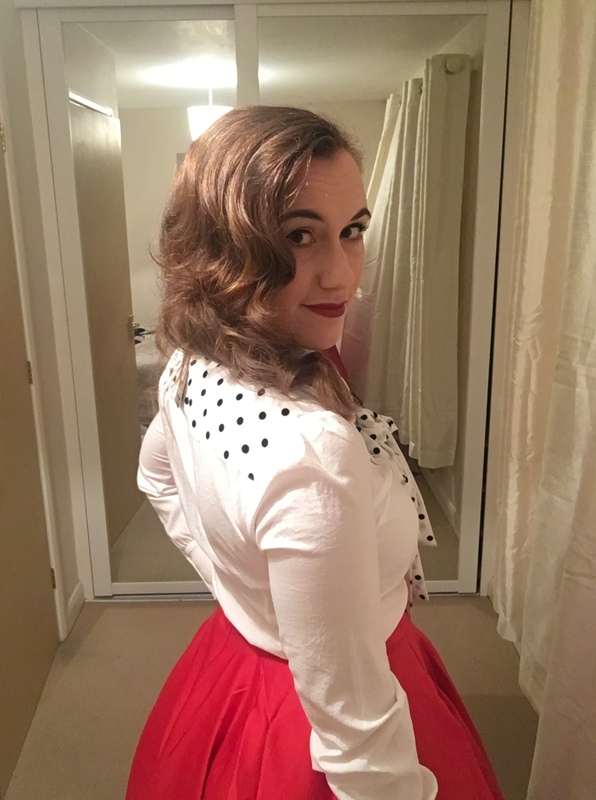 It has a built in petticoat; personally I would like to skirt to be a bit fuller but because of the detail at the back it just wouldn’t look right with an extra petticoat – but it certainly has the twirl factor, I tested it! That is my favourite thing about circle skirts, dancing and twirling! I would highly recommend visiting the Pocket Watch and Petticoats shop in Ipswich and Bury St Edmunds in Suffolk, they have fantastic stock (the blouse, trousers and dress all came from there!) and the staff are very helpful and enthusiastic! 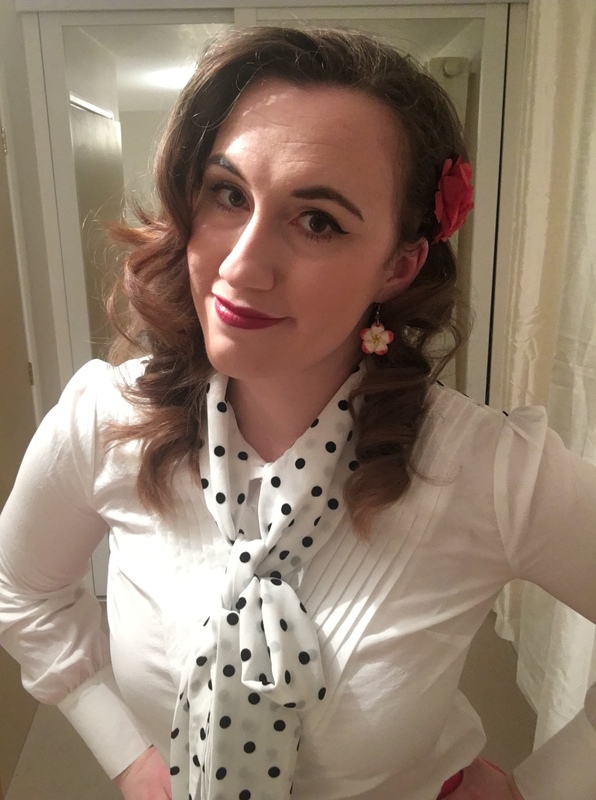 I hope this post was interesting and inspiring to anyone looking to add retro style to their own wardrobe! Prev My trip to the Vintage Fair! Next All about Hair Scarves! Think I have said before but if you ever visit Camden market, go into the stables, there is a shot there with all retro clothes you would like. There is a Vespa scooter in the entrance. A LOVELY COLLECTION OF VINTAGE! Trying Out the House of Drewvid Marcel Spray! Love Beauty & Planet – Vegan Haircare!